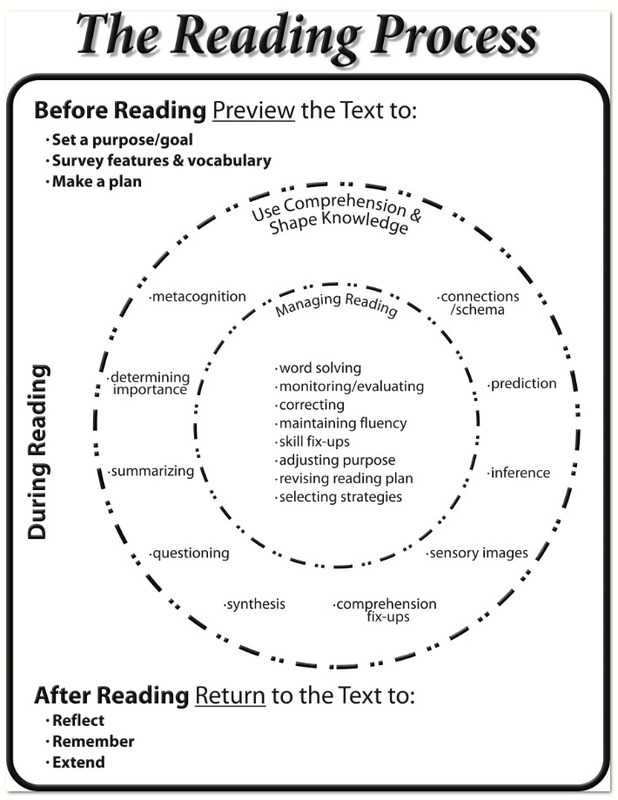 A couple years ago Canda and Shar made a reading process chart to help teachers and students visualize the reading process. 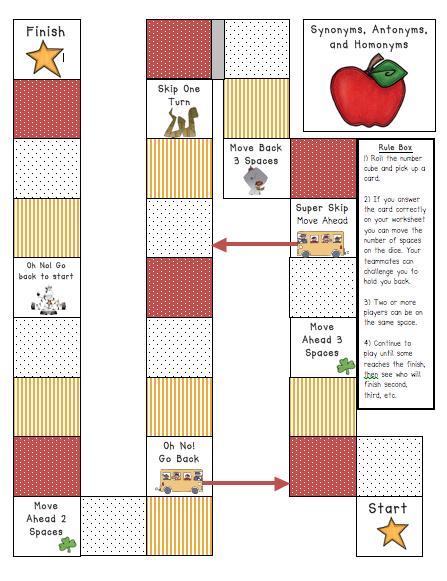 My 5th grade team (Natalie, Britt, Mark and I) liked the idea, so we used the chart to create a bulletin board version. 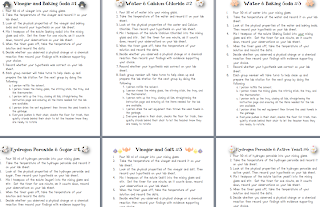 If you would like a copy of the master, to make your own CLICK HERE. The pictures below show our boards currently. 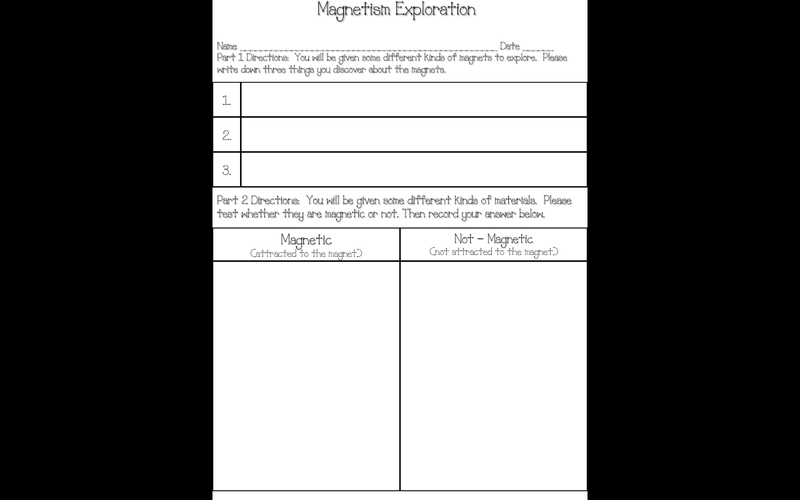 They are held to the whiteboard by magnets, so you can easily remove parts as you talk about them. 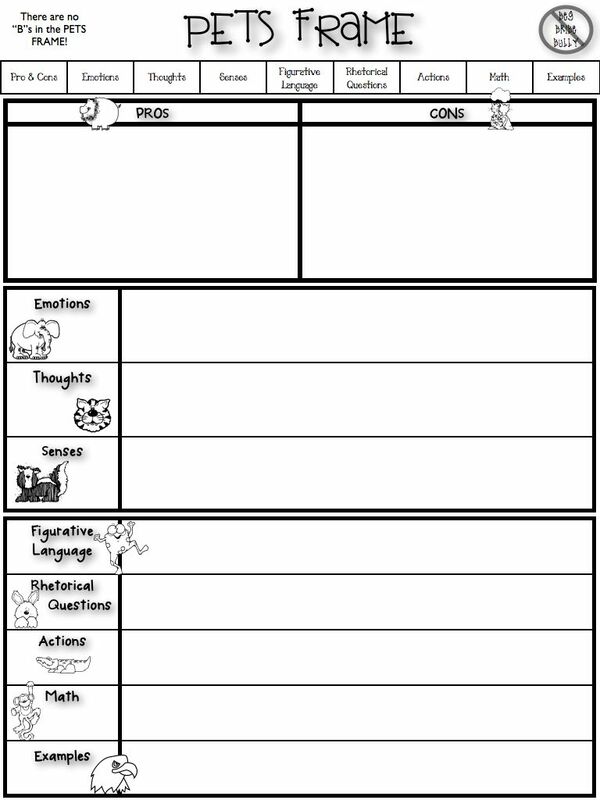 After being introduced to the acronym EARS (Expression, Accuracy, Rate and Smoothness) by an incredible reading teacher (Georgia), it became a pivotal part of how I teach fluency. Expression is so much more than just voice inflection. 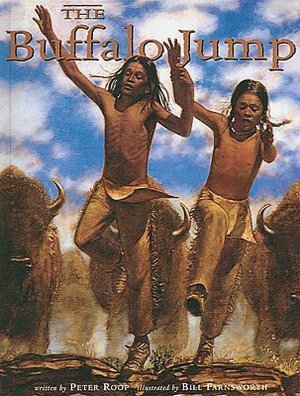 It can truly indicate comprehension as the students adjust their voice to show the mood/tone of the text. Accuracy matters most when our mistakes change the meaning of the text. Rate shows our ability to move through the text at a good pace...but speed loses meaning when it detracts from the expression. Smoothness shows that we can read in long meaningful phrases, heading punctuation. There is not much expression without smoothness. 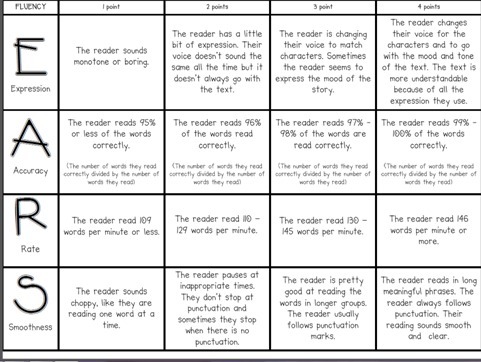 Below is a student fluency rubric that can be used by students, once EARS has been introduced. Partner 1 is reading orally (eyes on text). Partner 2 is reading along and analyzing mistakes. Partner 1 gets specific feedback based on the rubric. Partner 2 practices giving feedback orally. 4 minutes of focused practice where everyone is engaged. 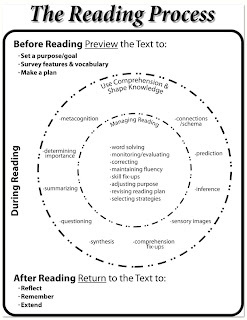 Students are doing repeated reading of content material, reinforcing the curriculum. 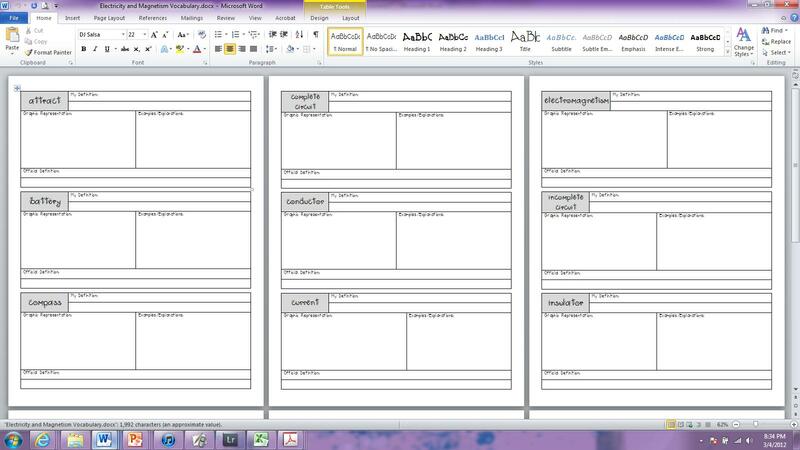 You can copy and paste or write any content you want to use into Word. Make sure you have turned on the readability statistics. 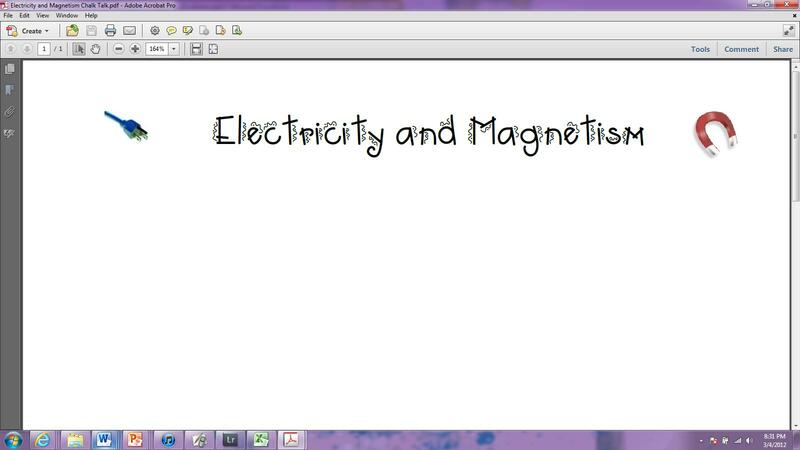 This will show you the number of words and will give you an idea of the reading level. Fluent readers are better at comprehending their reading. They do not constantly think about solving words and the meaning shines through. The most important part of reading is being able to understand it, so become a fluent reader so you do not miss meaning. 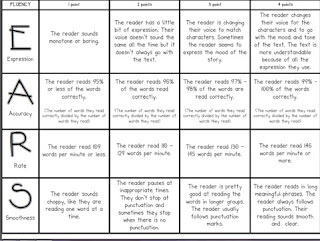 As we focus on fluency, we will use a rubric to remind us what fluent reading should sound like and what it should not. Read a story or passage with poor fluency. 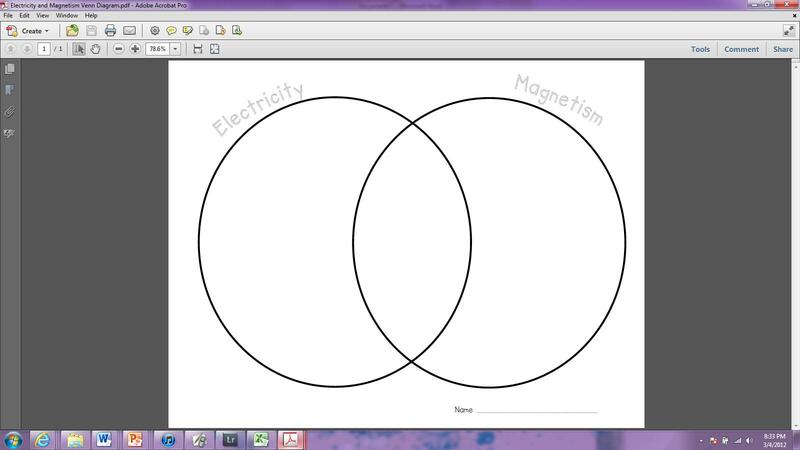 Ask the students to identify the problems. Next, fix the identified problems and try again. You will need model the importance of repeated practice continually. 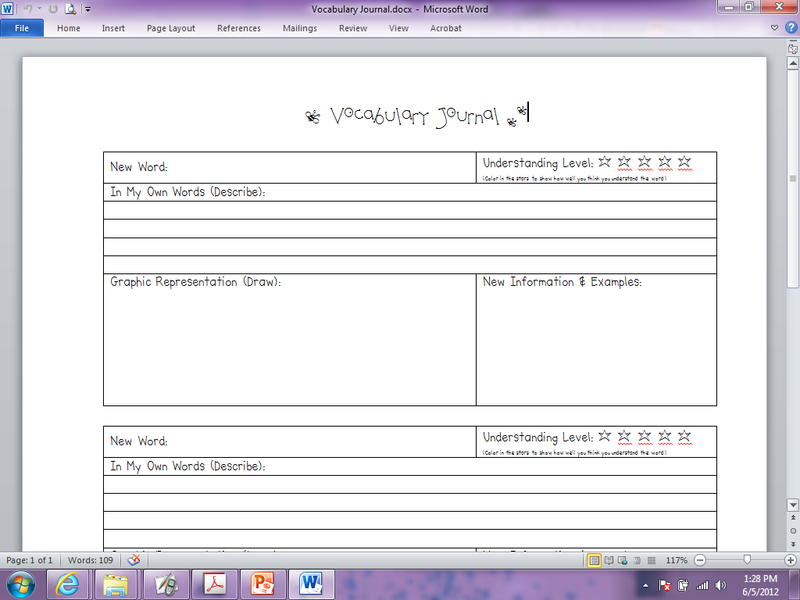 As you do this throughout your fluency lessons, help the students describe the problems more specifically, using the vocabulary on the rubric. 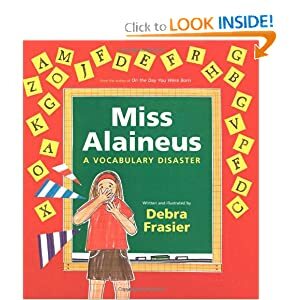 Introduce "Mood" - read a passage with good fluency but the total wrong mood and ask the students to identify what was wrong with your reading. Mood - have students read various passages with a different emotion: happy, excited, mad, sad, in love, silly, serious, bored etc. Have them practice those different emotions both with you and then on their own. They will laugh and enjoy the lesson as they play with their voice. If students are feeling very shy about this, make sure you boldly model for them. If you can make them laugh or even laugh at yourself, you will lower the affective filter (maybe not enough for them to step out today, but definitely in the future). Mood - Show the kids one of the mash-up trailers for a children's movie. Demonstrating how if you change the music or mood you can take a well-known story and make seem very different. I like the Marry Poppins Scary Movie Trailer, you don't need to show all of it to give the kids the idea. If you think it is too scary, there are many other choices. Examples: Toy Story 3 Scary Trailer or What if Jaws was a Disney Movie. Mood - Facial Expressions: Explain how facial expressions are vital to expressing mood. Ask the students to watch your face as you read a picture book. Make sure you read expressively and exaggerate your facial expression. Ask what they notice (ignore the heat of your self-conscious facial capillaries as they blush from the many penetrating eyes). 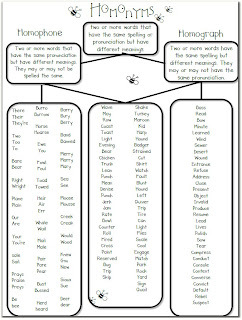 Next, tell your students to read a phrase (I usually choose one from a bulletin board around me). 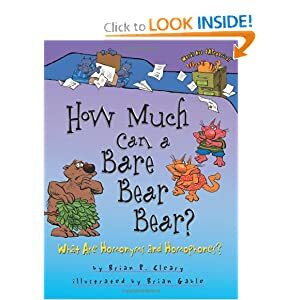 Ask the students to read it in a happy voice with a frown on their face. Have them try saying, "I am happy" with a frown on their face. Then repeat asking them to say, "I am sad" with a smile on their face. They will notice that you cannot make it really sound happy with a frown on your face and you really cannot sound sad with a smile on your face. They will giggle and think it is funny. Have them practice using facial expressions while they read. It will be uncomfortable for a while but let them know they will soon forget they are doing it; good readers do it naturally. Praise it when you see it. Mood: Action or drama - Good readers get into their story when reading aloud. They often use actions along with their facial expressions. Model this expressive reading then demonstrate a lack of expression. 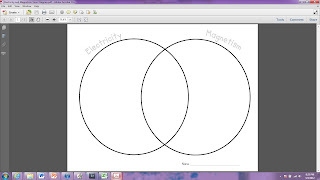 Finally, have student share the differences they noticed. Smoothness: model reading where you are stopping at the end of each line instead of with the punctuation. 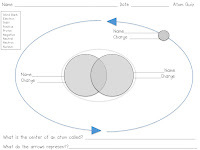 Ask the students to identify the problems. Talk about how much this changes the meaning of the text and how often it occurs. Model correctly after. 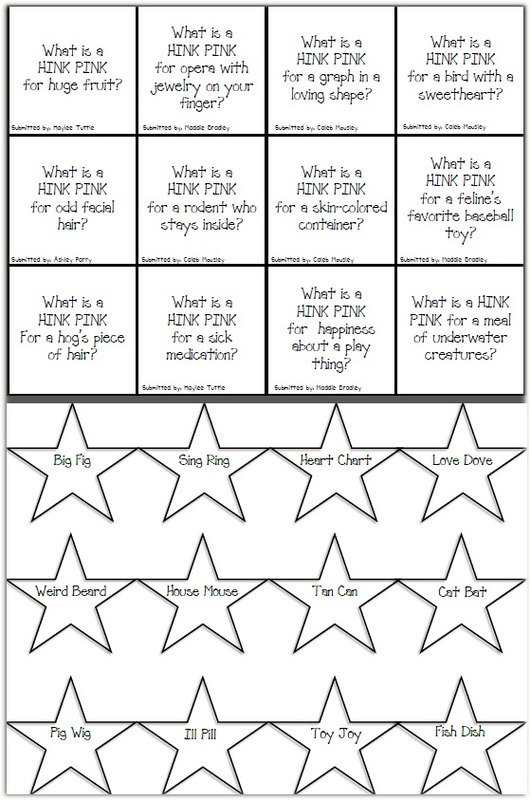 Smoothness: a really fun activity to help students notice punctuation is to have them do actions or make sounds for each punctuation mark in a reading passage. Pause, sigh, or tap pencils once for a comma. Make a stop sign with your hand, tap twice, hop, or click your tongue twice at each period, question mark (you can shrug your shoulders here), or exclamation point. You can slide at hyphens etc. Smoothness: Have students work on their breathing while reading. Model being out of breath with a really long sentence. Show how punctuation helps us know when to breathe. Make sure you have some challenging sentences for them to practice with. 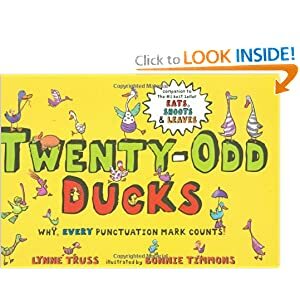 Smoothness: Read the book 20 Odd Ducks. This shows how punctuation can completely change the meaning of the text. 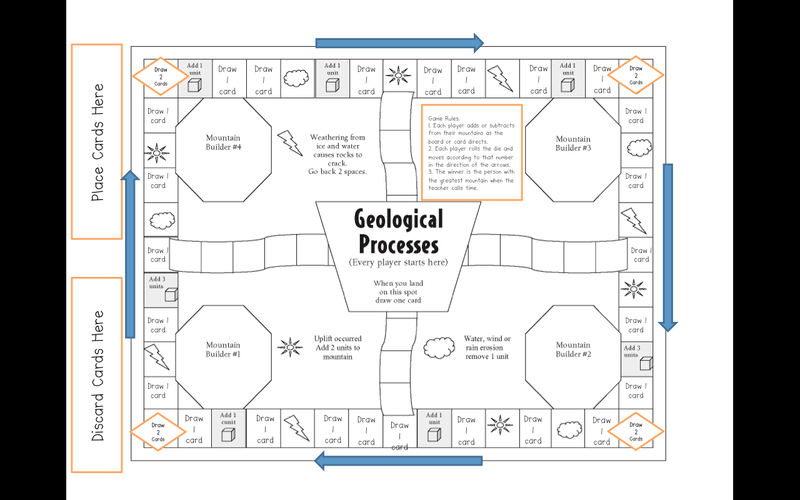 A fun extension we did was a class book where they had to write sentences about Earth Science, with different punctuation. They had to draw pictures to illustrate the various meanings. According to Utah Law (Utah Code Title 53A, Chapter 13, Section 109), we are supposed to teach character education in public schools. Described in 645 words, this law includes teaching about honesty, integrity, morality, civility, duty, honor, service, obedience to law, as well as respect, dignity and the idea of common good. With an integrated curriculum, we can meet these needs in many ways. One affective way to integrate fluency is to do it through music (with lyrics). Why would you do this? We call this "Song of the Day" at my school. It is one of our students' favorite traditions and we have received extensive positive parent feedback from this. So, how does "Song of the Day" work? · First, pick a song, find the lyrics and determine if it is appropriate and has a message about the topic you are addressing. CLICK HERE for a list of 114 possible songs. · Next, you need to display the lyrics for the class - preferably using a projector. · After that, you play the song and highlight the lyrics with your mouse as they proceed. I like to push their eyes ahead so I highlight a line ahead of where the lyrics are. If you have used the ideas of "Explode the Moment" and the acronym "DRAPES" for writing, but feel they are a little redundant, you may like my take on it. It is called the PETS FRAME. It incorporates ideas from both. 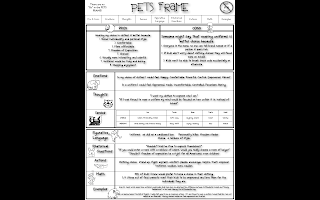 Here is an example of how to fill out the PETS FRAME using the topic of "School Uniforms" (written from the point of view that kids should be able to choose what they wear). 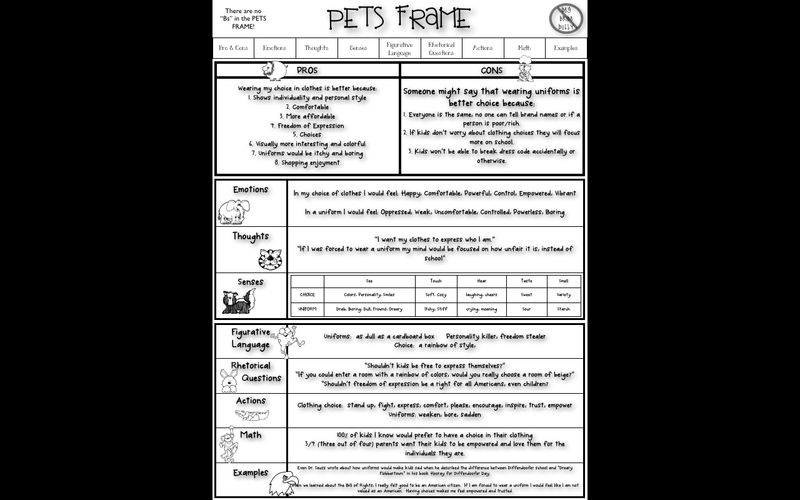 Click HERE for a PDF version of the School Uniform PETS FRAME. Use www.Timeforkids.com for some background articles to write about. Why can't we shock each other at school? If you want to use this board you will still need the cards which can be found by clicking HERE. The students were expected to take notes as they played. 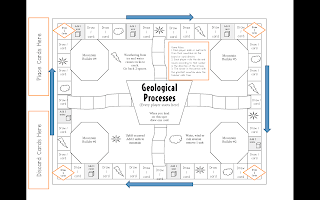 As a review activity, I made Earth Science "I Have, Who Has" cards. Click HERE for a copy of the cards. 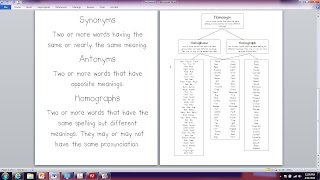 *Although this is the only place in the fifth grade Language Arts Common Core that synonyms, antonyms, and homographs are specifically mentioned, there are definitely additional places where they are integral to literacy. 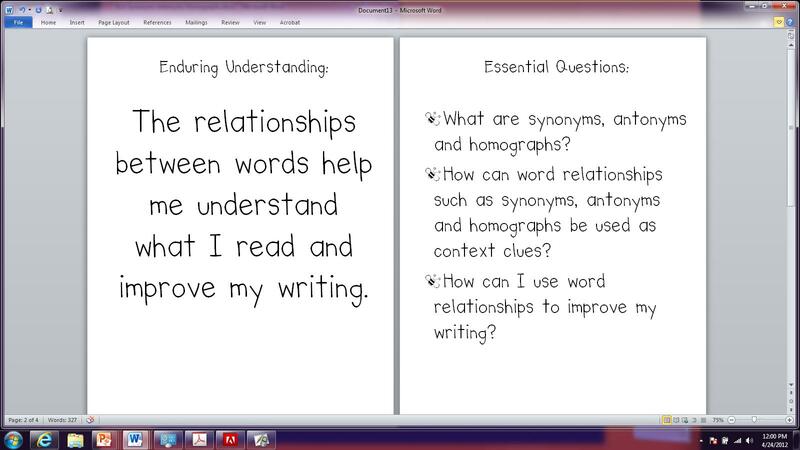 Enduring Understanding: The relationships between words help me understand what I read and improve my writing. What are synonyms, antonyms and homographs? 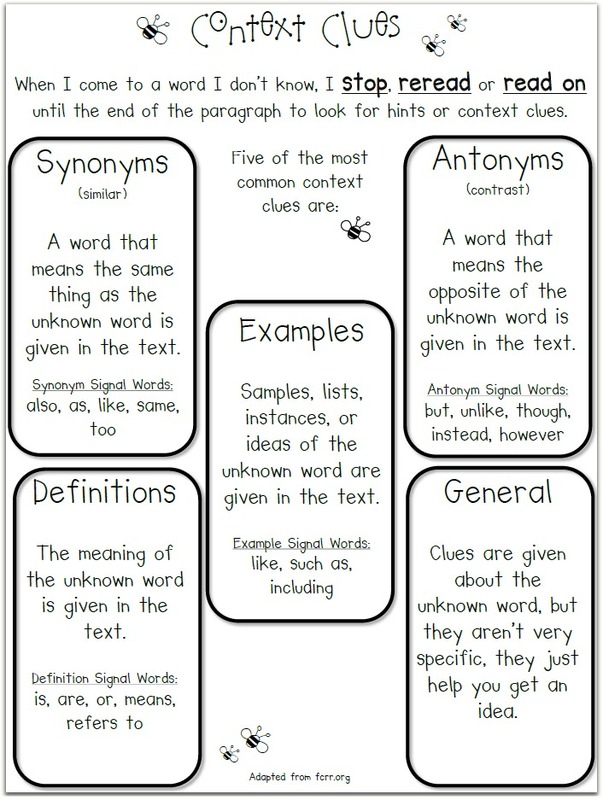 How can word relationships such as synonyms and antonyms be used as context clues? 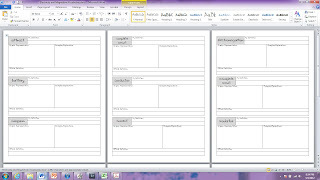 How can I use word relationships to improve my writing? Synonym – two or more words with the same meaning. 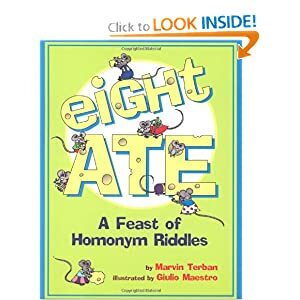 Antonym – two or more words with opposite meanings. 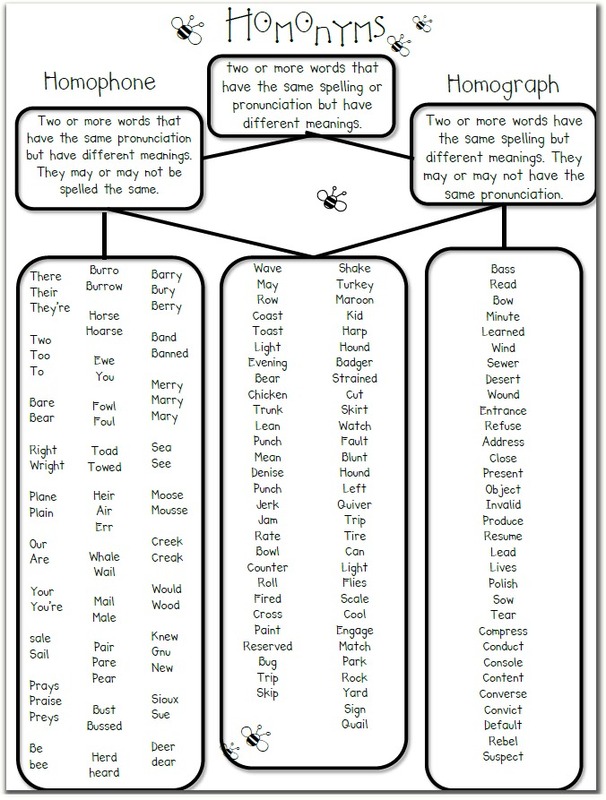 Homograph – two or more words that share the same spelling (graph) mean different things and can be pronounced differently. 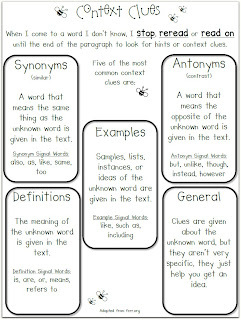 Context Clues – Hints found within the text that help the reader understand tricky words or phrases. 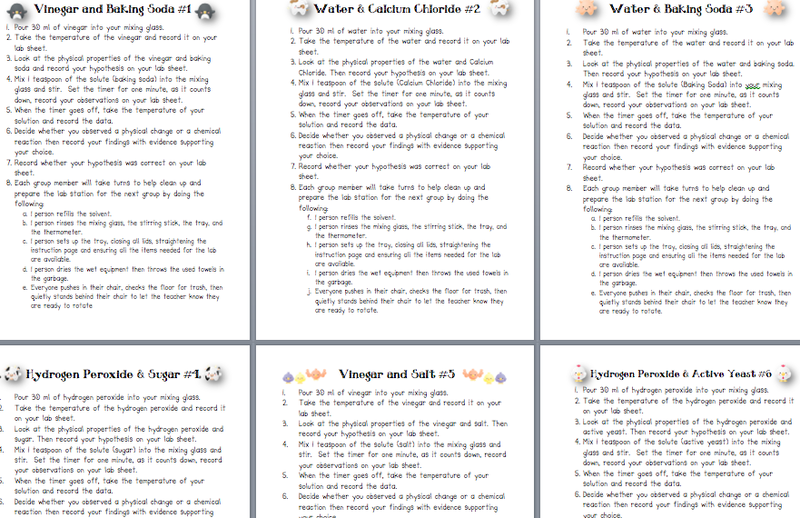 Students used this lab sheet while observing a set of 6 different clear substances: hand soap, acetone, vinegar, corn syrup, water, hydrogen peroxide. 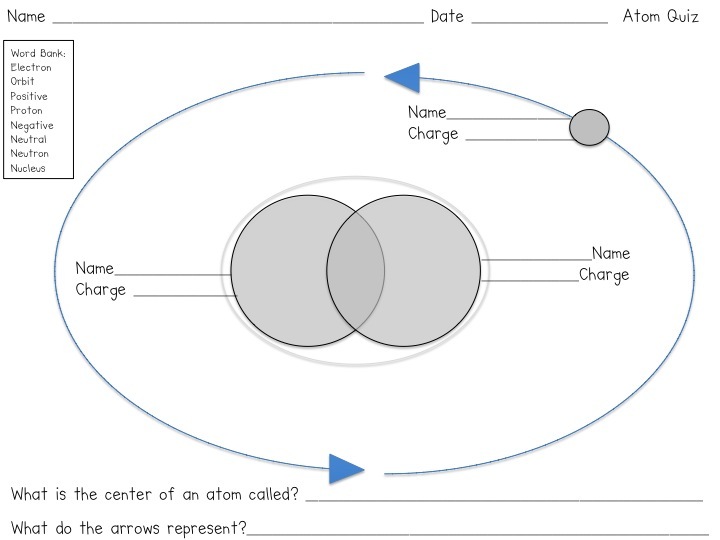 This quiz was given about a week after my atom lesson. I use two giant marshmallows smashed together to represent the proton and neutron. A small marshmallow represents the electron. 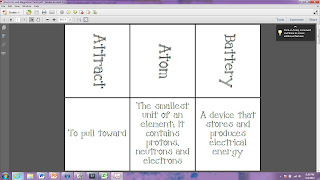 Students have to identify each part of the atom, their charges, where they are found and what the do. 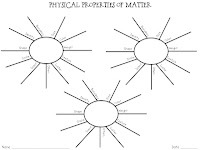 Example: They show me the proton and neutron are found in the nucleus of the atom. The proton has a positive charge (body language: thumbs up or plus sign. Analogy, it would be positive to be a pro-athlete). 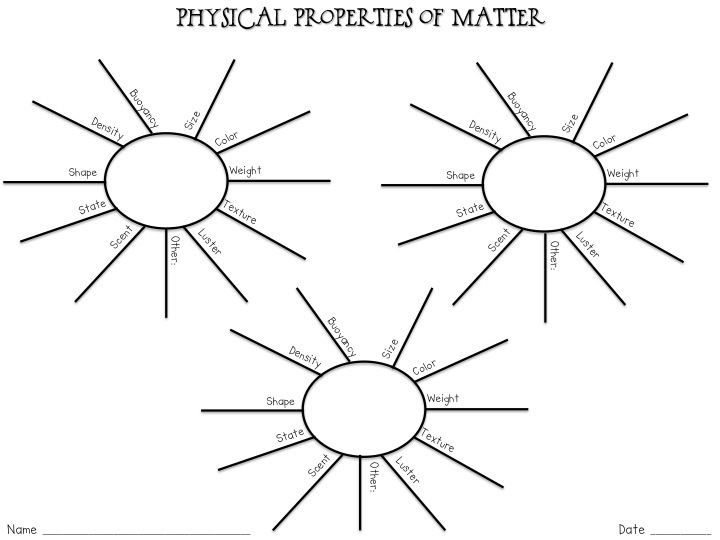 The neutron has a neutral or no charge (body langage: hands up showing that they want to stay out of it. Analogy, Switzerland or being stuck between two of your friends fighting). The electron has a negative charge and orbits the nucleus (body language: thumbs down for negative and circular motion for orbiting. 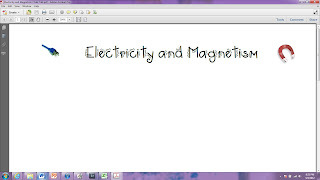 Analogy: electron sounds like electrocute, which would be a negative experience). 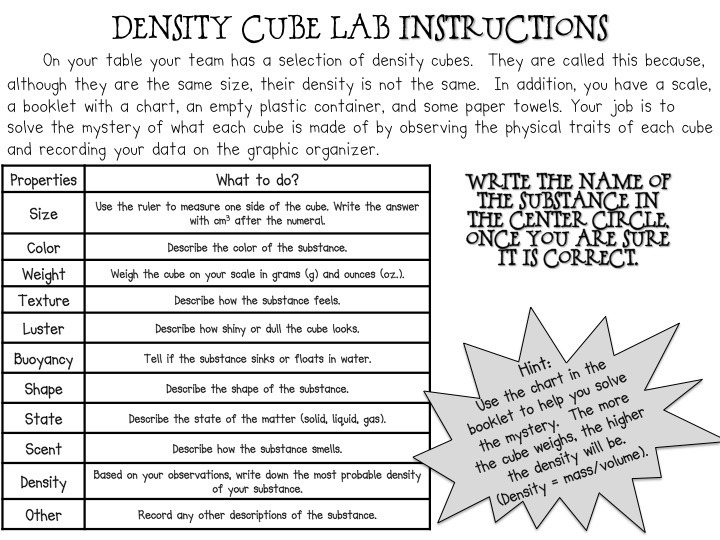 The district has a kit with density cubes that is great to reinforce physical properties, observation, and data analysis. 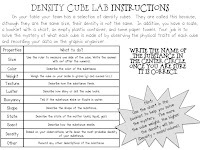 The link above is something I made to help scaffold what I wanted my students to do with the cubes. If you use sodiumpolyacrylate, you can click the link above for a lab sheet to go with it. This is a rotation lab, similar to the one done by Reaction Time (if you have Discovery Gateway come to present for your students). If you are not fortunate enough to have the presentation, you may want to add other rotations using the chemicals they use during the Reaction Time lab which include: cabbage juice, milk, and fertilizer. FYI: If you are wondering about the cute little animals and how they connect, they are simply there so the students have a visual to ensure they are recording the data in the correct spot on their lab sheet. Today is a great day to analyze the Preamble! Have the kids read the Preamble, watch the School House Rocks Preamble, highlight the difficult vocabulary words, match the vocabulary cards with their definitions, rewrite the Preamble with easier vocab, and finally discuss what the government is supposed to do for us, based on the words of the Preamble. 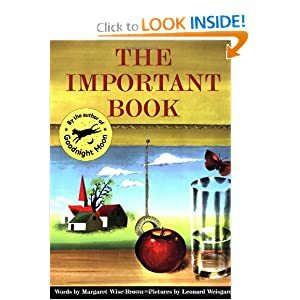 This book "An Interview with Harry the Tarantula" is used to demonstrate a format for students to use after researching the traits of an animal. 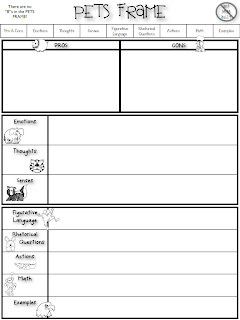 Use the author's craft to help students set up their writing. 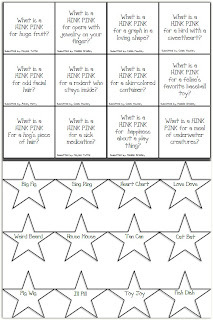 Use the graphic organizers below as templates for the activity. 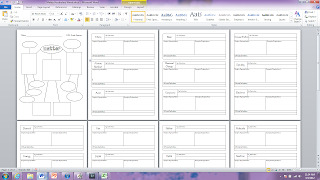 The following template goes with a Explorer Article called "Weird and Wonderful" and a National Geographic Book called "Animal Adaptations". 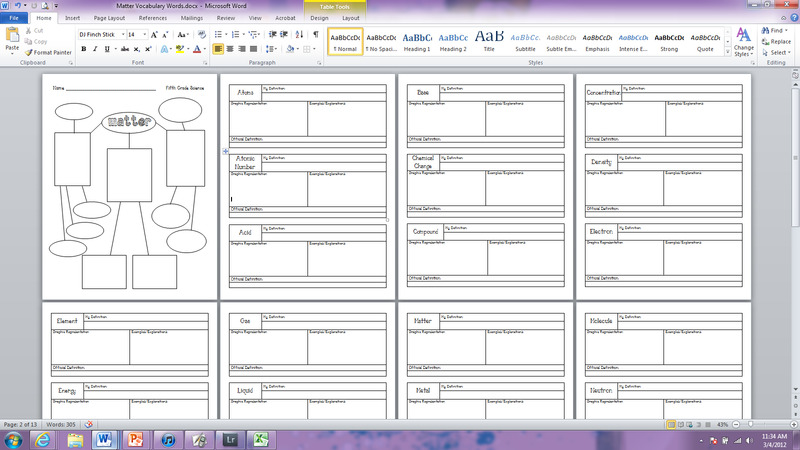 You can create the same scaffold with many texts on animals. Click here for the document. Technology Resource Presentation - This is a pdf from a powerpoint I made. 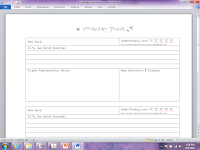 It highlights things such as iTunesU, Wordle.net, Donorschoose.org, as well as many other amazing resources. More to come, but here is a template... with the cute bees :-).